Waiting to hear what was going on in the room at the Knesset, where the Central Elections Committee’s counts and recounts of selected polling stations were going on, was for the assembled journalists, like watching paint dry. For those politicians waiting to hear their fates, by contrast, the tension must have been unbearable. 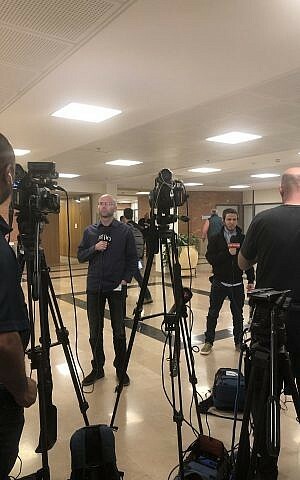 Forbidden from entering the recount room, journalists camped out in a large Knesset corridor, sitting on the marble floor or on the few chairs that had been dragged out of an adjacent room, with only cheap coffee, tea and a few plates of cookies to keep sugar levels up. Mostly, they were on their mobile phones, the TV journalists among them springing into action every hour, on the hour, to give uneventful updates, and the rest of us pricking up ears whenever Giora Pordus, the Central Election Committee spokesman, appeared. Pordus explained that additional checks were being made of results at a number of polling stations where the number of votes recorded, real time in protocols, did not match up with the numbers that had been entered into the election computer system. Some 30 to 40 stations were being looked at again. In addition, the votes of 36 stations were being entered into the system for the first time. Tamar Zandberg, leader of the left-wing Meretz party, swirled in to claim that while her party had been kept out of the counting room and out of the loop, United Torah Judaism representatives had been seen entering the room and were trying to “steal” votes from her party — a charge the UTJ denied. 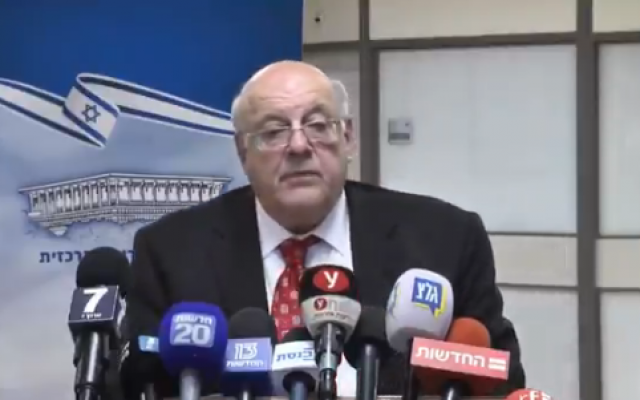 Rabbi Chaim Amsalem of Zehut — the party of right-wing libertarian Moshe Feiglin, which failed to clear the electoral threshold despite pollster predictions that it would end up as a coalition kingmaker — followed her to intone darkly that discrepancies were being reported between the number of votes registered in real time on polling station protocols and “witness reports” from those same polling stations. Pordus quietly advised the media to take what the politicians were claiming with a large pinch of salt. At 7.30 pm, the camera lights went on and Central Elections Committee chairman, Supreme Court Justice Hanan Melcer, entered to deliver a statement from a hastily erected podium. President Reuven Rivlin, he said, had asked him whether it would be possible to begin consultations with the various Knesset factions from the beginning of next week, as scheduled, on their preferred choice for Israel’s next prime minister. He was happy to announce that the final results would be made public by midnight, he said, although tiny changes could still be made after that as a result of “routine measures” taken by the committee. No mistakes had been discovered in the actual counting of votes or in the number of votes entered into the internal computer system, he insisted. Glitches revealed earlier in the day had been down to miscommunication between the internal computer system — where all the information was correct — and the internet site available to the public. “The figures that appear on the internet site tonight at midnight will be the correct figures and those [are the figures] that will be presented to the president of the state,” he pledged. During the entire day, he had remained in constant contact with the security services, he added, who assured him there was no evidence of any attempt at cyber interference. 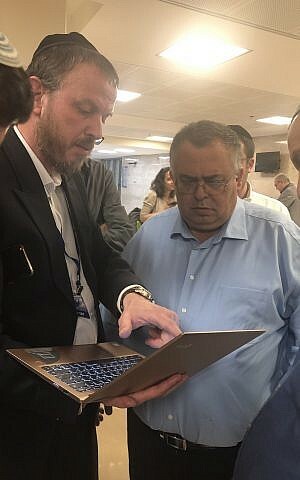 Behind him, Likud strongman David Biton had emerged and gone into huddled conversation around a laptop with a man from UTJ who had been hanging around the corridor for hours. They appeared to be looking at columns of election results and discussing the distribution of votes between Meretz and the UTJ. Several parties were likely to be affected by the final adjustments in the final official count. But those most worried, as the counts and recounts continued, were the leaders of the New Right party, which had fallen just below the threshold when the main count was completed Wednesday. The party was hoping that soldiers’ votes — part of the 6% of extra votes counted overnight Wednesday-Thursday — would lift it into the Knesset. All day Thursday, the elections committee’s website suggested that New Right’s hopes had been rewarded — showing it with 3.26% of the vote, clearing the threshold for four seats. Except that an official from the committee had briefed reporters in late morning that the site was wrong, and that the party had wound up 1,380 votes below the threshold — meaning zero seats. As midnight drew closer, the reporters perked up for the big news. 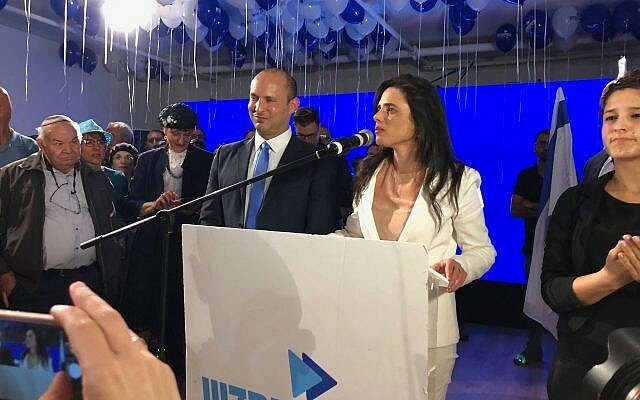 But the long hours of counting, recounting, dark allegations and technical glitches meant that even the final, official, categorical results would emphatically not mark the end of the 2019 Israeli election vote counting saga.